The best places to stay in magical Chiang Dao, Thailand. I gazed at the jade-hued mountain that dominates the skyline of Chiang Dao. The sun was sinking and I knew that fireflies would soon emerge to glitter in the dusky sky. Chiang Dao is paradise. It takes 3 hours on a motorbike to get to Chiang Dao, but I promise it's worth it. Andy and I have been more times than I can remember. The fresh, crisp air in Chiang Dao is noticeably cooler than in Chiang Mai, and it gets downright chilly in cool season. In this slice of paradise you can hike to mountain peaks on forested mountain trails, explore caves by torchlight, bicycle through fruit orchards and past rice paddies, dip your feet in cold streams or a hot spring and climb 100s of steps to reach a mystical golden temple. At night you can drink wine under the bright, bright stars, undimmed by light pollution. Then when you're sleepy-drunk you can climb under a thick duvet and feel cozy. It's heaven. If you're thinking about going; stop hesitating and go. I haven't met anyone who doesn't love Chiang Dao. 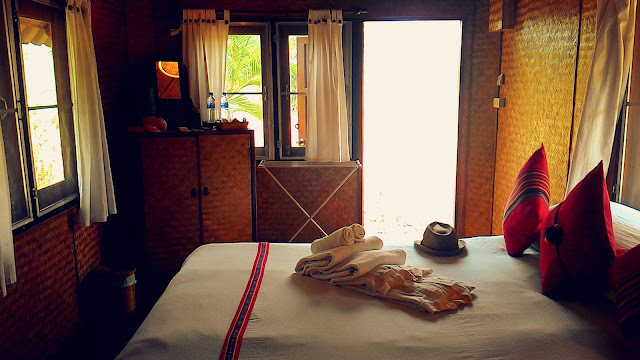 We've stayed in three places in Chiang Dao: Malee's Nature Lovers Bungalows, Chiang Dao Nest 1 and 2 and Chiang Dao Hut. Chiang Dao Nest is the best place to stay in Chiang Dao - both Nest 1 and 2 are beautiful beautiful beautiful. Chiang Dao Hut comes second and Malee's is third. They're all in the same stunning location, shadowed by the mountain. There are two Chiang Dao Nests, and they are both so wonderful. It's the perfect place to relax in nature near Chiang Mai, surrounded by lush green, birds and butterflies. It would also be a great place to work; there's free WiFi in the large communal airconditioned chillout floor at Nest 2 or plenty of shaded places to sit about under the tall trees. The food and drinks are phenomenally good. I'm not exaggerating - people have told me they drive all the way from Chiang Mai to Chiang Dao just to eat at the Nest, then drive home again! I heard that the chef is Michelin trained. It's way too easy to consume a lot of delicious food; prepare for a big bill but a very satisfied tummy. The simple-but-special wooden huts are really comfortable and beautifully lit. The bed is covered with a thick duvet and more soft pillows than you could ever use. The bathroom is stocked with homemade soap, kaffir lime shampoo and a white cotton robe for each guest. If you stay at Chiang Dao Nest 2, you can use the facilities in both Nests, so every time we go we spend an afternoon splashing about in the salt-water pool and playing ping pong at Nest 1! The superior bungalows in Chiang Dao Hut are big and have TVs and a large area to sit out on the porch. There was a hammock on our porch; much hammock-hilarity ensued. We spent ages on the porch; talking, reading and drinking wine. I played a Thai-style violin (awfully). For two people I'd recommend paying a bit more for the superior bungalow rather than the standard one - it's bigger, nicer, has a private bathroom and generally feels more homey, and is still a good budget price. Families can stay in a big two bedroom house! We've stayed at Malee's twice. It's OK, and it's fairly cheap. I would stay here if the Nests and Chiang Dao Hut are fully booked. There's a tiny cute pool to splash about in and colourful flowers blooming all over the garden. I hear that Malee's is the best at organising bird-watching trips. They rent motorbikes and bicycles.